The bell of this one I made a couple years ago for a drum. I never finished it and when I started making these I decided I would rather have an enormous didge than a drum that I can’t play well. These two stalks look like they were meant for each other and it has a nice curve just like out in nature. It has good volume and great sound and is so easy to do quick rhythms and takes very little breath. 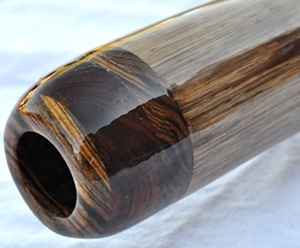 Nice thick strong wood on the top stalk which tapers to medium which is great for resonation. A real looker this one is.